G-Flex® T-Touch Technical Safety Glove is the latest technology in workplace handling. The T-Touch glove allows users to handle equipment in oily and greasy environments while still retaining firm grip and handling safety. "The G-Flex® T-Touch is one of the most comfortable gloves I have ever worn. 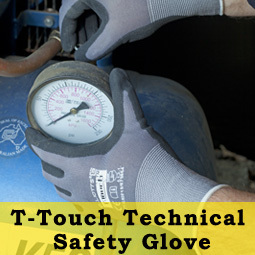 The T-Touch technology makes the glove highly breathable and therefore comfortable to wear. The glove is amazingly soft and yet it still offers the high levels of protection and performance." The breathable T-Touch coating provides outstanding air permeability which makes the glove so comfortable to wear. The T-Touch coating reduces sweating and allows the wearer to achieve a firmer safer grip on dry or oily materials. The T-Touch process incorporates a special treatment which changes the structure of the surface which creates a unique irregular tubular surface which increases the friction created when handing items and therefore improving grip and anti-slip. The G-Flex T-Touch gloves utilises highly abrasion resistant materials which improves the mechanical properties of the gloves. The innovative T-Touch layering technology provides improved abrasion resistant performance to improve and extend the life of the glove without compromising comfort and breathability. The T-Touch glove is available in a Black coating on seamless Grey Nylon liner or Black coating on a Hi-Vis Orange liner. 'Finger Dip'' technology gives total ventilation to back of hand. Extremely comfortable with excellent dexterity, sensitivity and tactility. Excellent levels of abrasion resistance. Excellent grip on most surfaces including those with light oil. Provides cut, tear and puncture resistance. Four sizes with colour coding identification on the cuff of each glove. Ideal for all applications where protection from light nicks and cuts are required and which require a high level of dexterity and sensitivity, especially where grip is important in oily and greasy conditions.